As the winds, rain, and flooding caused by Hurricane Harvey last week pummeled Southeast Texas, first hundreds, then thousands of residents sought refuge at the George R. Brown Convention Center in downtown Houston. By Tuesday night, August 29, more than 9,400 people had sought shelter at the center, a mammoth 5-block long structure with five large halls covering over half a million square feet. They came as individuals, as families, as extended families, as neighbors. Often with only the wet clothes on their back, they needed a safe, secure place to stay, dry clothes, a hot meal, and most of all, hope. And the Red Cross was there for them. Working closely with government partners such as the city, the county and the state, Red Cross shelter workers welcomed them in, helped them dry off, fed them a hot meal, and saw to their health needs and concerns. Where only a few days before, there was an empty cement floor, within 48 hours a village, then a town, then a city of over 10,000 residents sprang up. Neighborhoods developed. One hall was reserved for people with pets, another for families. People of many different heritages and backgrounds from all over Texas were united as survivors of a terrible natural tragedy. All entered this giant “lifeboat” mega-shelter knowing that they would now be safe and cared for. The Red Cross rushed workers from across the nation to Houston, even before Harvey struck. By the end of the week, more than 2,700 trained disaster workers were on the ground, and another 800 were on the way, along with more than Red Cross 200 emergency relief vehicles. Over 37,000 people stayed in 270 Red Cross and partner shelters across Texas on Saturday. At the George Brown Shelter, hundreds of local Houstonians reached out to help their neighbors. They sorted donated clothes, provided meals and food service, and rendered medical assistance. Boy Scout troops served up an oatmeal breakfast, and were introduced to folks who live outside of their middle-class neighborhoods. Stories were shared of rescues by strangers from rising flood waters, as neighborhoods were suddenly inundated. Travel around the area was difficult, as major freeways were under water for several days. Sad stories were also shared of relatives who had tried to drive to safety, but were swept away by the floods. Red Cross Mental health and health services professionals have provided over 11,000 contacts to provide support and care for the evacuees. Journalists from all over the world rushed to cover the story, with TV crews based here sending stories and pictures back to networks in countries such as Germany, France, Belgium, Czech Republic, United Kingdom, and Denmark. In addition, all of the national networks, the local and regional television and radio stations, were well represented, as well as many Texas and national newspapers. While squeezing nearly 10,000 people into one shelter isn’t optimal, everyone there was safe, out of the weather, and had access to hot food and medical assistance. Additional shelters opened up the next day and relieved pressure on the George R. Brown Convention Center shelter. Hurricane Matthew. Thousands of people in shelters. Thousands of relief workers responding. Too many lives lost. This disaster is a big one, for all of us, requiring many hands, heads, and hearts pulling together to help others in dire need. Shelter, food, and relief supplies are Red Cross priorities. And blood and platelet donations are needed from people in unaffected areas to make up for canceled drives. Check out the stories below. They’ll show you how the Red Cross is helping. 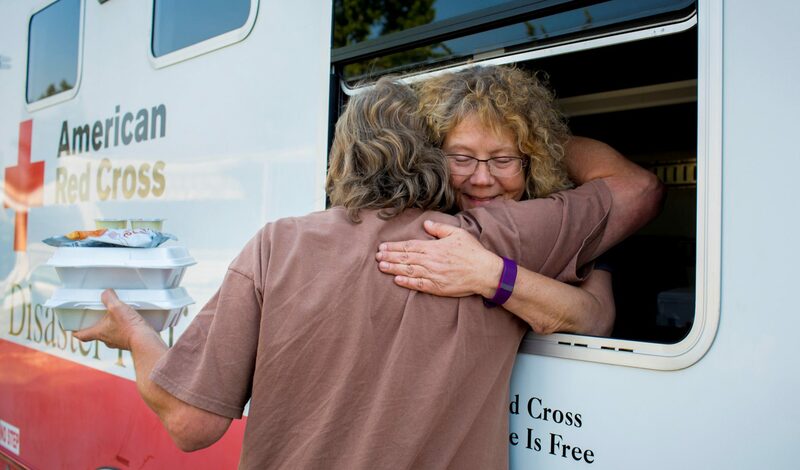 From Minnesota, there are 24 Red Cross relief workers deployed to help in the affected areas. More will likely be on their way in the days to come. Please support this relief effort. Click here to donate money to Red Cross disaster relief. Click here to make a blood or platelet donation appointment.